It's time for around the dog agility blog-o-sphere! Recent news...The Midwest Agility Championships slated to be held at the Libertyville Sports Complex in Libertyville, Illinois, October 23-25, 2009 has been canceled due to insufficient entries to hold the event. The FCI World Agility Championships were originally planned for Slovenia in 2010, will now be held in Rieden, Germany, October 1-3, 2010. 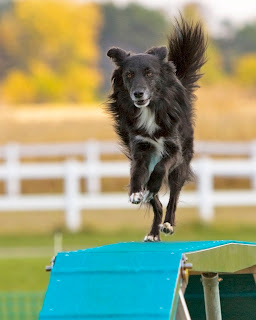 A couple of vids from FCI thanks to our friends at JustAgility. And big, big congratulations to Hugo and Kissy on their great 25th place overall individual and 12th place in agility. Great job! See their run here. Here's a link to all the FCI courses - good for some challenging practice! If you're ever looking for that USDAA four year calendar, here's the link. Clean Run continues to expand their library of article on everything from nutrition, to motivation to training tips and lots more. Be sure and visit. New DVD from Patricia McConnell, "Dog Play, Understanding Play Between Dogs and Between Dogs and People," looks interesting! The AKC announced yesterday that they will be offering AKC® Title Medallions to all owners whose dogs have earned titles at AKC events. Both the small and larger versions will be $25. They will be available in December of this year. Also, October 1st marks the first day that Mixed Breeds can register with the AKC to receive an AKC Canine Partners Listing and an AKC number for competition eligibility in mixed-breed classes at stand-alone Agility, Obedience and Rally events. AKC Canine Partners Listing includes a custom, blue AKC logo tag, as well as lifetime enrollment in AKC CAR Lost & Found Recovery Service, one-year subscription to AKC Family Dog magazine, AKC Canine Partners Certificate of Recognition, AKC Canine Partners Decal and eligibility to participate in AKC Companion Events. Enroll here if interested. Cost is $35.00. Clubs can now apply to allow mixed breed classes at Agility, Obedience and Rally trials for competition beginning April 1, 2010. If clubs have applied for an event that will take place on or after April 1, 2010, they may still add mixed breed classes by contacting the AKC. The 2009 Hyperflite Skyhoundz World Canine Disc Championship were held in Chattanooga, Tennessee lat weekend. Here are the results. A couple of routines from Mark Muir and Gipper, first place finishers in the Open Division. And last but certainly not least. Silvia's youngin's trick class from this summer! thanks for the fci links in particular.